微软发布基于手机芯片的Windows系统 - 品牌英语 - 金桥翻译论坛 - Powered by Discuz! Microsoft has shown a full version of Windows running on chips usually found in mobile phones. The desktop version of Windows was demonstrated working with three processors built around chips designed by UK firm Arm. The demonstration is significant because before now Windows has been closely connected with Intel chips. Microsoft would not be drawn on when the first products using these chips would go on sale. As well as running Windows, Microsoft also showed the work it was doing to get applications such as Word, Powerpoint and Internet Explorer running on Arm chips. 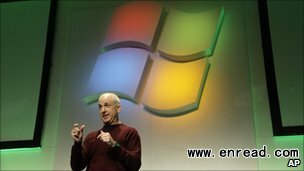 Microsoft was doing the work to get a full version of Windows running on mobile chips in a bid to end the compromises（妥协，和解） people typically have to make when using portable gadgets, said Steven Sinofsky, president of the Windows and Windows Live division during the demo. Also, he said, turning to Arm designed chips should mean lower power consumption and much improved battery life for future gadgets. About 80% of all mobiles, including Apple's iPhone4, are built around chips made from Arm designs. During its demonstration, Microsoft showed Windows running natively on chips made by Qualcomm, Texas Instruments and Nvidia. Mr Sinofsky would not say which version of Windows was running on its demonstration devices. He would only say that it was the "next generation of Windows". Many took this to be a reference to（提及，参考） Windows 8, which is due in 2012 and is expected to support multi-touch interfaces - capabilities missing from Windows 7. He also refused to speculate when the first Arm-powered devices running the full version of Windows would appear. "We've got the chip work done and now we start talking to partners about what kind of devices we can make," he said. Microsoft was also continuing its work with long-time partners Intel and AMD to get Windows working on the low-power processors they were producing. The demonstration came during a briefing at the Consumer Electronics Show in Las Vegas held prior to the formal opening of the show. Microsoft boss Steve Ballmer will give the opening keynote and is expected to expand on the firm's plans for Windows on Arm. GMT+8, 2019-4-23 10:19 AM , Processed in 0.033347 second(s), 16 queries .